A long time ago I read somewhere that when baby birds first hack their way out of the shell, the first thing they see they will think is their “mother.” Wikipedia tells me now that in psychology, it’s called “genomic imprinting.” That’s must be how those photographs of a dog with baby chickens or ducks following behind a dog came to be. When I was a kid, I had a three-legged pet pig that used to drag himself along behind me because I was the one forthcoming with food treats. My mom must have loved having her flowers crushed by a pig dragging his 60 pound (eventually) pot belly through them. Naturally, when I noticed sometime this weekend that a bird had shat nearly smack-dab near the middle of the picture window, I wondered who in thunder had taught him–or them, as there were TWO big gray and blue spats tinged with white–how to poop sideways! That took some clever bird(s). Sunday morning found me on the front deck with a stepping stool and assorted soft rag teeshirts and a can of window cleaner in hand. Thinking back over the years, I realize I’ve known quite a few clever birds who were quite entertaining in their own way, but never one that could do that sideways pooping trick. This is Henry, the parakeet we acquired when we lived in Connecticut. As you can see, Henry had the run of the house most of the time. His cage sat on daughter #1’s dresser with the door propped open, providing a bridge to the carved pink elephant embedded with tiny pink mirrored diamond shapes he liked to use as his toilet. 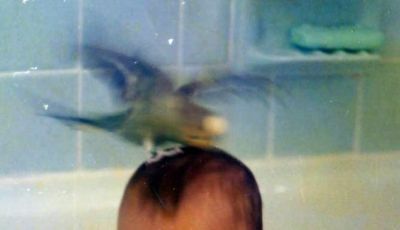 It was continually covered with droppings deposited as he sat jabbering to the parakeet in the mirror who looked exactly like him! He was so excited by his friend in the mirror that he also left slobber markings there. Cleaning tasks were constant, but it was worth it for the entertainment he provided for the whole family. He was quite content to fly around the house to wherever people were gathered. In time, he even taught himself to talk. Then we moved to Ohio, taking Henry with us, and life began to change for us. The girls were growing up and eventually going to school. One day the older daughter came home with a request. Could she please bring a baby chicken home to live with us because the school year was ending and the chickens hatched in the classroom all needed adoptive homes. How could I–who grew up with mostly animals and chickens as my only friends for the first five years of life because we lived in on a farm in the boonies–say no? So that’s how Birdbrain came to live with us. Birdbrain was a fast-growing white leghorn hatchling. By the time he came home with us he was at the gangly all-leg phase and losing most of his downy biddy feathers. Suffice it to say he was not his handsome best, and yes, he was a rooster. We set his big cardboard box house on the grate by the fireplace next to Henry’s cage. Now our Ohio house was in a neighborhood in a rural setting and we were susceptible to mice invasions. So with the danger of possible mice lynchings, Henry was only allowed out of his cage when we were present. One day we were rather startled when we returned home after an outing to see Henry’s cage door hanging open, with Henry nowhere to be found. We called and called, and when that didn’t work we spread out over the house, down in the basement, on a frantic search. Then somebody decided to check to see if Birdbrain was in his box. He was. And so was Henry. Birdbrain was acting like a chicken acts, scratching and peeping happily in the chicken feed sprinkled on the floor of his box. To our delight, so was Henry. Apparently he’d made a new friend, the best kind, one who could teach him new tricks. We got rather used to seeing Henry visit Birdbrain in his box, and if he wasn’t in his cage that’s where he’d be. One day we decided to let Birdbrain visit Henry. We opened the cage door and carefully set him inside and Henry dropped down to the floor from his perch and joined him scratching on the grit-lined newspaper. Not long after that, there Birdbrain was one day–balancing awkwardly on Henry’s perch, while Henry clung to the cuttlebone on the side. Who says an old bird can’t learn new tricks? True story! As for the culprits involved in my poop-splattered window, who knows who imprinted them with the ability to do their dirty deeds? I dismiss them as two teenagers, most likely, out past midnight after they’d snuck outside their bedroom windows, flying about looking for ways to do a little imprinting of their own. They had just happened by our house when they finally perfected their little joke. I must say, the clean window looks smashing, regardless of how it came about.